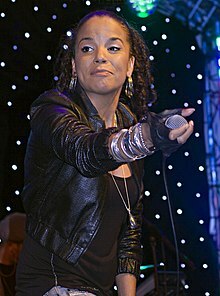 Niomi Arleen McLean-Daley (born 26 April 1981), better known as Ms. Dynamite, is an English rapper, singer, songwriter and record producer. She is the recipient of the Mercury Music Prize, two Brit Awards and three MOBO Awards. She was born and raised in Archway, a district in north London, to a Jamaican father and a Scottish mother. As stated on the programme Ms. Dynamite: In Search of Nanny Maroon, in addition to her Jamaican-Scottish parentage, she shares Bajan, English, Irish, German and Grenadian ancestries. She grew up listening to reggae and hip-hop music. Though she wanted to become a schoolteacher or social worker, her biggest aspiration was to be a musician. She is the eldest of eleven siblings, one of whom is an artist and part-time journalist known as Akala, and attended Acland Burghley School in London. Ms. Dynamite (originally Lady Dynamite) was first known for her vocals on the UK garage underground track "Booo! ", which was regularly played on London pirate radio stations and was later released as a single. While working at the radio station RAW FM, Ms. Dynamite was discovered by Richard Forbes ("DJ Sticky") at a West End club. Interest grew from all major British labels and eventually she was signed via her management Bigga Beats to Polydor Records, where she met producer Salaam Remi, who cultivated her talent. She released her debut album, A Little Deeper, in 2002, which featured hit songs "It Takes More" and "Dy-na-mi-tee". In 2003, the album was released in the United States to critical acclaim. In 2002, Dynamite won the prestigious Mercury Music Prize, for A Little Deeper. She donated the £20,000 prize to the NSPCC. She performed at the closing ceremony of the 2002 Commonwealth Games at the City of Manchester Stadium. On 2 July 2005, she performed at the Live 8 concert in Hyde Park, London. Among the songs performed was "Redemption Song" – a Bob Marley-penned song. On 11 September 2005, she returned to the limelight (having taken time off to have her son, Shavaar) with a new album titled Judgement Days. Featuring more social commentary, in songs such as the first double A-side single, "Judgement Day" / "Father" and the Tony Blair critique, "Mr Prime Minister," reviews of the album were not as favourable as those of her debut. However, "Judgement Day" reached No. 25 in the UK Singles Chart. On 6 January 2006, Ms. Dynamite was arrested outside a London nightclub after a brawl in which she unwisely punched a policeman in the face while in custody. She admitted her guilt to avoid having the CCTV played in court and was sentenced to sixty hours of community service. The second single from Judgement Days was due to be "Fall in Love Again" (previously titled "When I Fall in Love"), with a release date of 30 January 2006. A music video was shot for the track but the single was cancelled and she was dropped by the studio following her arrest. The video did not surface until June 2006, when it was leaked on to the Internet. In February 2006, she won the Naomi Award for Worst Urban Act. Since her trouble in January 2006 and her disappearance from the public eye, Ms. Dynamite confirmed that the much rumoured A Little Darker album would be released in March 2006 as a mixtape. After the confirmation, the album was pushed back to June 2006. Also, in April 2006, Ms. Dynamite confirmed that there would be no more releases from her Judgement Days album, and that she was due to start working on new material. A collection of new and upcoming UK hip-hop and garage artists, was compiled by Ms. Dynamite and her rapping brother Akala, who was voted Best Hip Hop Act at the MOBO Awards in September 2006. In November 2006, she took part in a television show called The Race on Sky1, in which ten celebrities had to compete against each other on the track in different races building up to a thirty lap Formula Ford race on 12 November 2006. About ten laps into the race Ms. Dynamite hit the wall on the pit straight at about 100 mph. She was air-lifted to hospital for overnight observations but later released. After taking a break from the music scene, Dynamite guest-hosted BBC Radio 1Xtra, and stated she would be releasing a third album, Democracy, in 2009, with the first single from the new album being "Bad Gyal". However, this was later pushed back as she concentrated on other projects and motherhood. Meanwhile, she appeared on Hell's Kitchen on ITV1 in 2009, finishing fourth, and later as an expert adviser on Goldie's Band: By Royal Appointment on BBC Two. Since then she has appeared on several collaborations, notably Katy B's second single, "Lights On", which peaked at number 4 in the UK singles chart in 2010, and the Magnetic Man track "Fire", which appeared on their debut album. A single, "Neva Soft" (produced by Labrinth), was released in 2011, although the promised album did not appear. Since then she has been the featured vocalist on the DJ Fresh Versus Jay Fray track "Dibby Dibby Sound" (February 2013) and a David Guetta and Showtek song for the former's 2014 album Listen "No Money No Love" along with Elliphant. ^ "Mercury Prize official site". Retrieved 7 September 2007. ^ Roberts, David (2006). British Hit Singles & Albums (19th ed.). London: Guinness World Records Limited. p. 370. ISBN 1-904994-10-5. ^ "Akala & Ms Dynamite Ringtones, Download Akala & Ms Dynamite Mp3 and Akala & Ms Dynamite Music at Wippit". Retrieved 11 March 2015. ^ "Allen: 'Ms. Dynamite return is massive'". Digital Spy. Retrieved 11 March 2015. ^ "Categories". ITV Player. Retrieved 11 March 2015. ^ "BBC Two - Goldie's Band: By Royal Appointment, Episode 1". BBC. Retrieved 11 March 2015. ^ Ms Dynamite interview: "I don't want to be put in a box" – Music Interview. Digital Spy (3 August 2011). Retrieved on 16 April 2012. ^ "Ms Dynamite", 100 Great Black Britons.